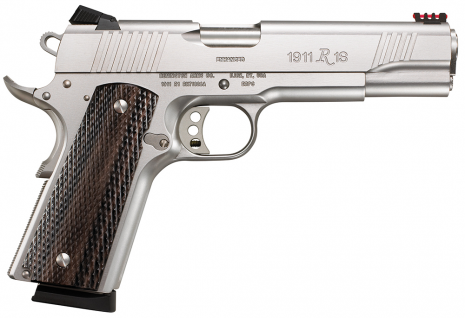 REMINGTON® 1911 R1™ ENHANCED COMMANDER •Stainless steel frame & slide •Stainless finish •Oversized, flared ejection port •Wide front & rear cocking serrations •Stainless steel Match-grade barrel •Extended Beavertail grip safety •Adjustable skeletonized trigger •Adjustable, 3.5 to 5.0 lb. trigger pull •Dark laminate grips •Red fiber optic front sight •Novak style adjustable rear •Includes (2) 8-round mags. •Ht. : 5.75" •Barrel Length: 4.25" •OAL: 7.75" •Wt. : 38 oz.